"Oh, is this where I'm supposed to say, 'What is this all about? ', and he says, 'Shut up, I ask the questions'?" This is not your father's Philip Marlowe. 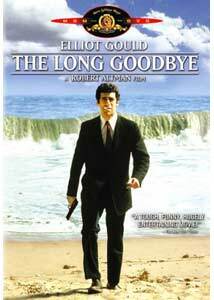 Robert Altman investigates and subverts the detective movie with The Long Goodbye, in many respects doing for this genre what, a couple of years earlier, McCabe & Mrs. Miller did to the Western. He re-teams with Elliott Gould, one of his leading men in M*A*S*H, to create a private eye story that, while botched by MGM in its initial theatrical release, has developed a cult following over the decades; the studio rights some if its past wrongs done to the movie with this impressive DVD. Gould is an unusual choice for Marlowe, but that's of course much of the point of this enterprise. He lacks the straightforward, laconic authority that Humphrey Bogart exuded in the same role in The Big Sleep—Gould's Marlowe doesn't always say what he means nor mean what he says, and there's a wryness, edge and irony to him that Bogie would disparage. It's the difference, in short, between the 1950s and the 1970s, in popular imagination, anyway. Bogart's Marlowe is in many respects the precursor to James Bond, the guy who drinks hard, gets the girl, and captures his man; Gould's Marlowe has a greater affinity with J.J. Gittes, another L.A. private eye discovering the darkness in his home town, in Chinatown, produced a year after this movie. Based on a previously unfilmed 1953 Raymond Chandler novel, the story has all the appropriate conventions of the detective story: Marlowe gets a late-night visit from his pal Terry Lennox (Jim Bouton), who's in some trouble, totes a mysterious valise, and needs a ride rightthisminute to Tijuana. Word soon comes back to Marlowe that Terry is dead, a suicide; before killing himself, he murdered his wife, Sylvia. And in the bag was $355,000 in cold hard cash belonging to Marty Augustine, a lithe little thug played with springy energy by Mark Rydell. Augustine thinks that Marlowe has his money, but the detective pleads ignorance; nevertheless, Augustine takes him on a ride not entirely unlike the one provided by Dennis Hopper to Kyle McLachlan in Blue Velvet. In the middle of trying to sort out the Lennox mess, Marlowe gets a call about a new case: Eileen Wade (Nina Van Pallandt) wants him to track down her missing husband, Roger (Sterling Hayden), a well-regarded writer. The Wades and the Lennoxes lived just a few houses apart, on the beach, in Malibu Colony—Marlowe rightly suspects that Mrs. Wade's uncannily timed phone call is more than mere coincidence. As ever, Altman gets terrific work from his actors. Hayden looks like Captain Ahab, with his unkempt beard and slouched cap; he exudes a kind of neurotic authority very different from his fine performance of the previous year, as a police captain who has his differences with the young Michael Corleone in The Godfather. (In an earlier time, Hayden himself might have made a great, dangerous Marlowe.) Henry Gibson is creepily effective as a messianic doctor seemingly in the Werner Erhard mode who has an unnatural sway over Wade, and Van Pallandt is both lovely and demonstrates that there's a fierce sting in her tail. Even Bouton, former Yankees pitcher notorious for his tell-all book, Ball Four, is convincing as Marlowe's fallen friend, the spectre haunting the detective for most of the story. As with many Altman pictures, there's a self-consciousness of playing around with the conventions of the genre, and an awareness always that we're watching a movie. The security guard at Malibu Colony regales drivers with his (not very good) celebrity impressions, including James Stewart, Barbara Stanwyck and Walter Brennan; Marlowe nearly runs over a dog he calls Asta, in obvious tribute to the terrier owned by Nick and Nora Charles in The Thin Man; it's as if everybody has seen and read the Raymond Chandler stories except for Marlowe himself. The cinematography here is especially fine, and gets ample attention in the supplemental material (see below). Some of the shots are just astonishing—the most jaw-dropping is one of the Wades fighting in their home, while reflected in the glass, between them on the screen, is Marlowe on the beach, dodging the waves. It's a funny instance of how it sometimes takes someone from outside of the country—cinematographer Vilmos Zsigmond escaped to the U.S. from Hungary in 1956—to see America fresh and clearly. Also worth mentioning is the title song, written by John Williams and Johnny Mercer—it doesn't rise to the level of a standard, but in this movie, it's absolutely everywhere, and the filmmakers seem to be having great fun with it. It's on the radio in various recordings; it's the dirge played by a Mexican marching band at a funeral; its first couple of notes are even chimed by the Wades' doorbell. The film is also notable for a silent, unbilled cameo by Arnold Schwarzenegger, as a mob bodyguard. Image Transfer Review: Earlier prints of this film I've seen have been so washed out as to be nearly unwatchable, but MGM deserves much credit for this handsome release. Colors are generally steady and black levels are solid; the care that Altman and cinematographer Vilmos Zsigmond took with contrast quality are well preserved here. There are a couple of instances of debris and imperfections on the print, but the transfer cannot be faulted for what seems like problems with the source material. Audio Transfer Review: Altman's style of shooting brings with it inherent audio problems, but the director also seems to disdain looping, so there's a certain rawness to the English mono track. The beach scenes may have been especially rough on the shoot, for on occasion the actors max out on the audio equipment, presumably to compensate for the sounds of the ocean. But generally dialogue is clear. Extras Review: Altman and Gould were interviewed, separately, in 2002 for the accompanying feature, Rip Van Marlowe (24m:31s), which offers their reflections on many aspects of the production. Gould sounds as if he's dealt with many of these issues in therapy; he talks about the peak of his celebrity, in the early 1970s, and how in some respects he squandered that precious, elusive commodity. Altman is typically engaging discussing his work—he originally wanted Dan Blocker for the role of Wade, but he passed away before the production began, and Sterling Hayden was his reluctant second choice. (He was spectacularly happy with Hayden, though, as he should have been.) Beware: this documentary gives away the ending to the movie, so don't watch it first. The cinematographer discusses his work on the picture in Vilmos Zsigmond Flashes The Long Goodbye (14m:22s), and it's lots of shop talk—he's very good at describing Altman's affection for zoom lenses and why other directors don't care for them, and in disparaging the harsh contrast that shows up in most feature films today. Zsigmond also discusses what became the signature look of the film: post-flashing, or exposing the film stock to a certain amount of light after the shoot, to create a more natural, period look. This is elucidated even further in an article by Edward Lipnick for the March 1973 issue of American Cinematographer, reproduced on the disc, which also provides some background on the history of the production. The trailer is pretty standard stuff, and the extras are rounded out with five original radio spots. As Gould's Marlowe likes to say, "It's okay with me." If such a thing as a subversive detective story is possible, this would be it. The particular attention paid to the cinematography on the DVD supplements make this one a layup, and it's always a treat to be in Robert Altman's capable hands.